The Mekong Delta city of Can Tho and Gimcheon, the central city of the Republic of Korea discussed their future cooperation in trade, investment and social welfare in a meeting between the two cities’ leaders on November 13. Chairman of the People’s Committee of Can Tho Vo Thanh Thong hosted a reception for Mayor of Gimcheon Park Bo Saeng in which he briefed his guest on the local socio-economic development, noting the RoK has been assisting the city in two ODA projects – the Vietnam-Korea Industrial Technology Incubator and a project supporting the city in agricultural mechanisation. 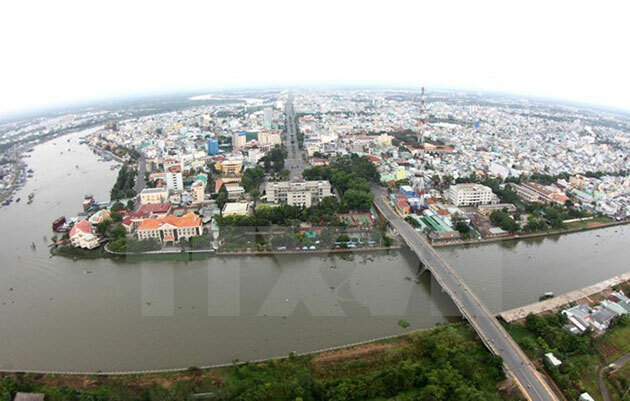 Can Tho, the Mekong Delta’s economic hub, looks to enhance partnership with the region’s developed economies, particularly the RoK, Thong said, adding that the city welcomes all Korean investors to explore business opportunity here. Park, for his part, said Gimcheon wants to boost cooperation with Can Tho in the fields of economics, culture and education for mutual development. The Korean city wishes to set up partnership between Gimcheon University and local leading universities such as Can Tho University, Nam Can Tho University and Vo Truong Toan University, he noted. Can Tho would be the first in the Mekong Delta to have links with Gimcheon University after the University of Social Sciences and Humanities in Hanoi, Hanoi Polytechnic College, and HCM City Vocational College of Technology. He unveiled that Gimcheon plans to coordinate with travel agencies in Vietnam to introduce more tours to popular destinations in the Korean city, for example community-based holidays or those with a wide range of activities like horse riding, mountain hiking, and sightseeing at ancient relics. The city also wants to boost cooperation with Can Tho in infrastructure development and high technology with the aim of helping improve the partner’s competitiveness and backing its shift from agriculture to support industry. By October, the RoK has operated nine FDI projects, worth 247 million USD, in Can Tho, mainly in the fields of sport equipment, electronic games, retailing and wholesale and counseling services in industrial development and investment./.